Stainless steel is often supposed as one of the surfaces which can never get a stain, since it is apparent from its name, but even stainless steel can get stains on it from acid. Stainless steel is often used in numerous objects around the house. Often people have kitchen and bathroom sink made of stainless steel which can easily be exposed to acid. Sometimes, while cleaning the drains or even objects that have impossible marks on them, we often use acid based cleaners or even acid, while forgetting that they are the very reason that may cause more harm to the stainless steel surface. This is because stainless steel is an alloy which may be resistant to rust but is still vulnerable to acid. Acid based cleaners and acid itself, if spilled on the stainless steel surface react to the surface i.e. they cause a chemical reaction which cannot reverse. This reaction also leaves very ugly looking acid stains on the surface of the stainless steel. It is best to get rid of the acid on the surface of the stainless steel so that the chemical reaction doesn’t damage the stainless steel deeply. The quickest way of getting rid of the acid is to rinse it off. This causes minimal damage and the stain left behind can be easily cleaned. If, however, the acid has been left on the surface for too long, it may cause corrosion, leaving deep cracks. They cannot be fixed but the acid stains left on them can be removed by the following methods. 1. In order to protect yourself from the strong chemicals used in this method, start by wearing the gloves and the mask. 2. 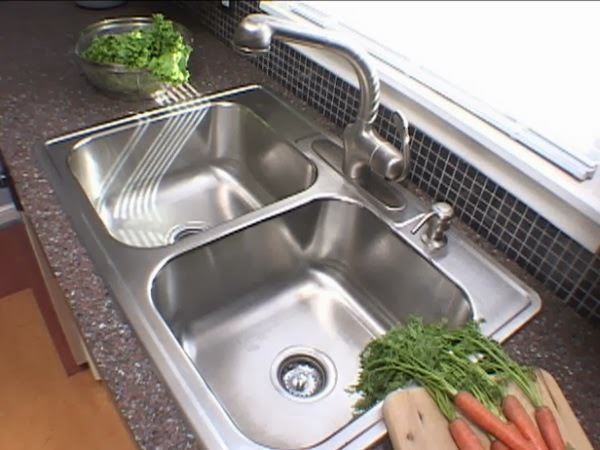 Clean the area on the stainless steel that has been stained by the acid by pouring water on it. For your own convenience it is recommended that the spray bottle is used to spray water on the stain. 3. Next, take the empty bowl and add equal amounts of water and baking soda. The equal amounts needs to be according to the stained area. The two must be mixed till they form a paste. If the surface of the stainless steel is rough, add water to the paste so that it is thin enough to reach in through the cracks. 4. Apply the mixture to the stained surface of the stainless steel. If you see no change in the color of the stain repeat step two. Now add ammonia to water instead of the baking soda. And apply to the surface. 5. After the acid stain has been completely removed from your stainless steel sink etc., use the cleaning towel to remove all the chemicals. This can be done by dipping the cleaning towel into water and cleaning the surface. · The chemicals used in this method are strong; therefore it is important to be careful not to spill them. Take maximum precaution while using ammonia. 1. Add equal amounts of baking soda and the liquid dishwasher into a bowl and make a paste. 2. Dip the cleaning towel into the paste and apply to the stainless steel surface that has been stained by the acid. 3. Keep applying the paste and scrub thoroughly. This will be enough to take out a fresh acid stain from your stainless steel sink etc. 1. Dip the soft cloth into vinegar and apply to the stainless steel surface stained by the acid. 2. Gently rub in clockwise strokes till the stain vanishes. 3. If you feel there is still a little bit of the stain left wipe the surface clean with a clean towel and apply olive oil. Scrub till the stain vanishes. For method 1, how long do you leave the baking soda/ammonia on the stains before checking the results? Are they instant or will it take some time? I will definitely go for method 3 wherein the needed solution are not chemical based. This will definitely help a lot of mothers in dealing with their kitchen sink mess. Unlike the tips I found via Thesisgeek which are not effective at all. None of the above methods work. I found the perfect solution - Brasso (metal polish). It completely removed the stain! I tried all of them but cldnt remove thr stains of lysol toilet cleaner from the tap. Does anyone know how to remove these stains? Where to buy the Brasso? I really abused my sink trying to clean a clog with one of those ineffective caustic agents. It blackened the sink. I still had to resort to a plumber to snake out the obstruction. His suggestion was to never flush coffee grounds. I was still left with an ugly sink. Brasso sounded good to me. It took a lot of elbow grease to bring a small area to a dark gray. So I combined the Brasso with 3M 150 grit Precision (wet-dry) sanding sheets on a random orbital palm sander and then progressed on to 400 grit wet-dry. (Further progression could bring you to a mirror finish.) 400 was sufficient. Cleaned the grime with paint thinner. Happy again. U can get brasso from any supermarket.. how do u use it though? What do u buff it with? Stains are the worst nightmare for every homeowner, it harms our flooring and other parts of the homes. Basically, it is quite tough to remove stains from floors, stainless steel, kitchen countertops, and many other places. So, we need to take some essential tips from this article in order to remove stains from our favorite place of the home. My husband tried to unclog the stainless steel kitchen sink with a strong drain cleaner. The result was a black stain and professional plumber. Brasso worked! I used it with very fine steel wool in small circles. Left strong sulfuric acid on stainless steel sink overnight, resulting in etched gray stains. BARKEEPERS FRIEND cleanser and polish with steel wool scrubbing took it all off. Didn't try Brasso, but it might have worked as well. Never ever use steel wool on stainless steel! big mistake. Can I use autosal? Vl it work! Brasso really works!! I got some acid stains on my kitchen sink after using a strong drain opener. Tried Brasso with a heavy duty scouring pad (3M Scotch Extreme Scour). The ugly stains came off within one minute! I didn't even need to scrub hard. So happy. Thank you for the Brasso tip. However, I do suggest trying to remove the stains asap. The stains on my sink were from 1.5 days ago. Brasso is basically ammonia. Check the ingredients. I recently purchased a stainless steel refrigerator, which my son's pit bull promptly "marked" with a lovely arch of urine across the lower freezer door. I was extremely upset to say the very least. He has also done this to my new to me ultra suede couches and chair ( suffice it to say, the dog is no longer allowed inside my home). I had purchased the expensive stainless steel cleaner and polish (huge mistake! ), and promptly set about cleaning my new fridge. The urine stains (or any other smudges, fingerprints, etc) would not come off. After much research and frustration, I finally went back to my usual cleaner, COMET! The best cleaner in the world! Safe for all surfaces, you do not need a mask or any special prep, and it removes any and all stains with little to no effort! For those really stubborn, set in stains (rust, etc) you may need to scrub extra, but thethe stain will come out. COMET is inexpensive, you can purchase it anywhere and is by far, the best product for cleaning any surface. My fridge looks brand new! Even took off all fingerprints and smudges, which the other stuff didn't budge!